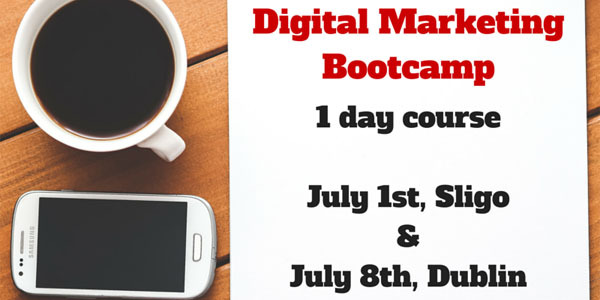 Our next Digital Marketing 1 day training course is running in Sligo July 1st and at our office in Dublin city centre July 8th. Are you getting the most from your Digital Marketing efforts? Course Aims – How will I benefit? This intensive one-day course will demonstrate some practical tips for success in Digital Marketing for your business. Discover mobile, social media and local search marketing tips to get your business found online. We demonstrate some tools to help you manage your social media channels making sure that you’ll be able to continually improve your campaigns, boosting results and profitability. This course aims to demonstrate and deliver practical tips to drive more qualified traffic and sales leads to your business and manage your digital brand online. Course Objectives – What will I learn? Is your website mobile friendly? – What options have you? This is a Basic level course. This course is aimed at marketers, communicators, business owners and professionals looking for practical Digital Marketing tips which yield results. Cost: Sligo €200, Dublin €220 , *early bird discounts apply! Venue (Sligo): Digital Hub Sligo, 31 Stephen Street (Public Parking & Directions here). Our tour company is based in the USA but we spend much of the year in Ireland. We want our new website to reflect the authenticity of the types of tours we provide. We could have chosen a web design company anywhere, but we asked OmniScience Design to do the work for us because they have years of experience and yet they are refreshingly enthusiastic, creative and energetic, as if they just began their own enterprise. OSD built our website from the ground and did an amazing job of it, especially when you consider we were 3000 miles apart when it was being built. OSD used various technologies, including Skype, to communicate with us daily, if not hourly, as we worked as a team to create www.wildwestirishtours.com. Marie Harkin worked tirelessly (Ireland is 5 hours ahead of us) making sure we were satisfied with every word, photo, button, application and device on the site. The OSD team were very patient and we benefited from their years of experience as they gently guided us toward a wonderful finished product. We are extremely happy with the work of OSD and we have a close working relationship with them as we move along updating and fine tuning the site. There are many website designers here in the Unites States we could have used who might have less for us, but we wanted authenticity, a crisp modern website and most importantly for us, excellent customer care. OmniScience Design came through with flying colours and proved our faith in them was well placed.